Berlin is often seen as a city that is supportive of innovation and creativity. With Germany’s strong role in technical research and development, it’s not surprising that those interested in sonic experimentation are drawn to the country’s capital. Nicholas Meehan is one of a long line of American citizens who have been attracted by the creative possibilities that Berlin offers. One of the striking things about the ISM is their skill in getting some serious collaborators on board with the Hexadome project. “We were about two months away from when we needed to start building the Hexadome and we still didn’t have all the technology we needed sorted out,” says Meehan. “So, I went to ISE (Integrated Systems Europe) in Amsterdam. I was told that Helen and John Meyer (of Meyer Sound) were going to be there, so I bought a train ticket and went to see if I could have the chance to speak with them.” And he managed just that. “We talked about their history together – in ‘60s San Francisco and the company’s history,” he says. The conversations were obviously successful, as boxes full of speakers – the same make as those found at Disney, Skywalker Ranch and NASA – began to arrive at ISM. Meyer Sound supplied some technical support in setting up the Hexadome as well. “Just to be in the midst of the dialogue between the experts from Meyer Sound and the experts from ZKM and seeing this kind of magical structure unfold was quite remarkable,” he adds. Immersive audio is a relatively new area of sound experimentation outside academia, so standards are few and far between. This makes reproducibility between performances a problem. Meehan, alongside his colleagues at the ISM has been part of a working group, the Immersive Pipeline Workshop, at Goldsmiths University in London trying to identify common standards, so that artists in this field can have some assurance that their works can be more easily translated between installations. The ISM has managed to attract a wide range of artists to ‘perform’ in the Hexadome, including Ben Frost and MFO, Frank Bretschneider and Pierce Warnecke, Tarik Barri and Thom Yorke and, alongside his collaborator Peter Chilvers, Brian Eno. “Peter sent over some examples of his and Brian’s work together. We’d literally only just set up the Hexadome 24 hours before their arrival,” says Meehan. Eno has a track record of working in these kinds of immersive environments, such as the Bloom: Open Space installation in Amsterdam (covered by AMI in April 2018) and, of course, is no stranger to the creative and cultural attractions of the city of Berlin itself. 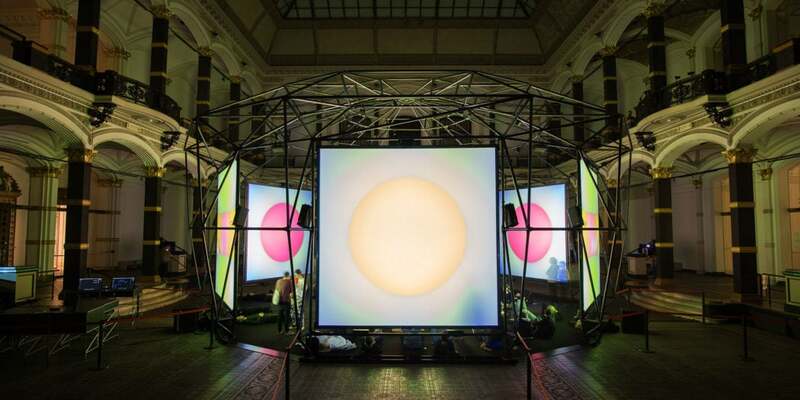 What do you get when you place Brian Eno, Thom Yorke and other artists inside a large metal structure fitted with six giant screens and over 50 speakers? An audiovisual revelation.